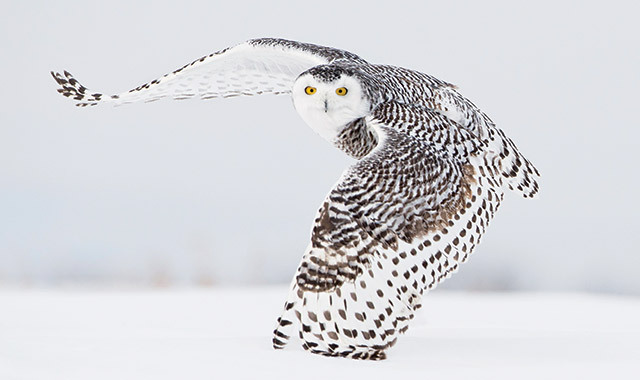 Snowy owls have a wingspan up to 6 feet wide and can fly at speeds of 50 mph. That is, until the winter of 2013-2014, when a much larger number of snowy owls than usual appeared in some areas in the lower 48 states – some as far south as the Bahamas. Hundreds were reported in the Upper Midwest alone. This event is not an owl migration. This is an owl irruption. Traditionally, an acute food shortage causes these movements, but over the past few years, studies have shown that lemming populations in the Arctic are at an all-time high. With this abundance of food, the owls have been able to reproduce at record numbers, and this high population of owls has led to a natural dispersal of birds out of their home ranges. 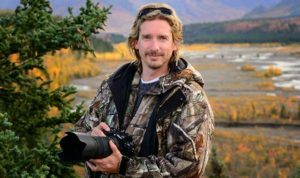 David C. Olson maintains a studio and gallery just off I-90 in Rockford, at the Clock Tower Inn, 7801 E. State St. See more of his work at DavidOlsonPhotography.com. This entry was posted on Friday, February 20th, 2015 at 11:58 am	and is filed under Features, Top Posts. You can follow any responses to this entry through the RSS 2.0 feed. Both comments and pings are currently closed. Back in the late 80s I was in the woods south of Oregon, IL in the fall. Not a sound could be heard. Suddenly I heard the whoosh, whoosh, whoosh of wings and looked up to see one then a 2nd snowy owl come through the woods. Then they were gone, but it was the highlight of the day. I don’t have much nature photography, mostly people. I’ll stop to see your gallery next time I’m in Rockford.